7/7 Inquests: Open Justice or No Justice? "I thought this was about open justice but now it seems to be more about getting any sort of justice." On Thursday 18 November, the 7/7 Inquests will be delayed while the Appeal Court hears Home Secretary Theresa May's challenge, on behalf of the Intelligence Services, to Lady Justice Hallett's decision to hear evidence in open court. Hallett's decision to sit without a jury has already pre-empted any opportunity for 'ordinary members of the public' to see the evidence. Most, if not all, of the relevant material can and will be put before me in such a way that national security is not threatened. "I am all too aware, given the events of the weekend, of the unenviable task facing the Security Services. I repeat, sources may be withheld, redactions made. "I do not intend to endanger the lives of anyone. I do not intend to allow questions which might do so. I do not intend to allow questions which I know to be based on a false premise or which I know to be misleading. There may be times when the parties will simply have to accept my ruling without demur. I may have to forbid certain questions. I may have to rephrase them. "Finally, I wish to emphasise I do not intend to make findings adverse to the Security Services which I know to be false." Justice Hallett appears to have already decided the parameters of the questions that will be allowed and what the outcome should be. Despite this, the Home Secretary obviously knows that there is evidence which cannot be allowed into even a very limited 'public domain'. This raises the issue, and the spectre of Tony Blair's promise to "bring together all the evidence that we have and we will publish it so that people, the victims and others, can see exactly what happened". Wasn't all the evidence already presented to the Intelligence and Security Committee? Wasn't all the evidence contained within its final report, completed in July 2008 and eventually published in May 2009? Hallett is content to have names redacted - redactions which already exist within the ISC report - so what could the Intelligence Services possibly have known prior to the events of 7 July 2005 which cannot be presented to the public even in redacted form? The Review addresses the many unanswered questions which arose following the conviction of the 2004 fertiliser bomb (CREVICE) plotters. In making our judgements about whether anything was missed or overlooked, we have focused on the information available at the time. The Review contains some highly sensitive intelligence and an unprecedented level of operational detail. As a result, there are some instances where we have agreed that information must be redacted from the published version of the Review in order that individuals are not put in danger, that current operations are not compromised and that our enemies do not learn of the capabilities of the UKâ? ?s intelligence and security Agencies. There are also some instances where the courts have ruled that information cannot be published. These redactions have been agreed with the Agencies, the police, the Crown Prosecution Service and government departments. We wish to note that the Security Service, the Metropolitan Police Service and West Yorkshire Police not only co-operated fully with our inquiries, but were helpful in seeking to ensure that we could publish as much material as possible and thereby provide the public with as full an account of these matters as possible. Could 7/7 Have Been Prevented? POLICE have only just discovered that they held the fingerprints of the ringleader of the July 7 bombings on file before the attacks, it was revealed today. West Yorkshire Police said it "recently" found two sets of Mohammad Sidique Khan's prints in its archives - one of which dates from when he was arrested aged just 11. The force has launched an inquiry into the records as it prepares for the upcoming inquests for those killed in the 2005 London atrocities. West Yorkshire Police took Khan's prints for the first time when he was arrested in April 1986, aged 11, for being involved in receiving stolen goods. The second set of prints was taken by the force in February 1993, when Khan was arrested for assault. The records came to light after Scotland Yard contacted West Yorkshire Police last month to check whether they had the July 7 bomber's fingerprints on file. Details of the discovery emerged at a hearing at the Royal Courts of Justice in London to decide what form the inquests should take. 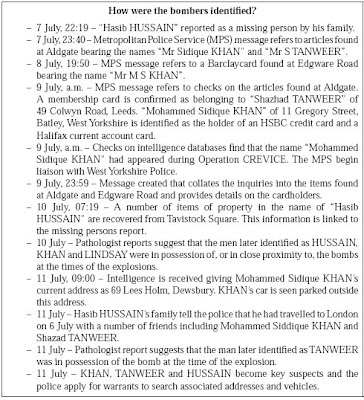 West Yorkshire Police said in a statement: "In preparation for the inquests into the events of July 7 2005, West Yorkshire Police recently found two sets of fingerprints in its archives belonging to Mohammad Sidique Khan, of which it was previously unaware. Max Hill QC, counsel for the Metropolitan Police, stressed that this was not the first time that Scotland Yard asked West Yorkshire Police for detailed information about Khan. "What Have They Got To Hide"
Clifford Tibber, one of the lawyers representing families, said the decision was "outrageous". "The coroner has already said that there are no circumstances in which she will allow the personal safety of any member of the Security Service or the interests of national security to be put at risk," said Mr Tibber. "The prime minister and the deputy prime minister are both on record as supporting a public inquiry. The Government have twice failed to introduce legislation to hold inquests in secret and now they are trying to introduce it through the back door. What have they got to hide?" The families of the bereaved have been refused legal aid to be represented at this hearing despite being awarded exceptional funding by the Legal Services Commission to be represented at the 7/7 Inquests. Exceptional funding was denied to the families of the four accused men, and they now have to sit in silence while accusations of the accused's involvement go unchallenged and unquestioned. Despite Inquest law forbidding the apportioning of guilt or blame, the four accused men should rightly have remained the 'alleged' or 'apparent' bombers rather than being described as the de facto bombers. Only when or, more realistically, if the Inquests reopen into the death of the four accused - Khan, Hussain, Tanweer and Lindsay - is there likely to be an opportunity for their families to question witnesses or examine the evidence. And, even if the inquests were to be opened into the four accused, based on its decisions regarding the inquests to date, it is unlikely that the Legal Services Commission will make the same 'exceptional funding' available for them to have legal representation. Do there exist any lawyers, many of whom have made a pretty penny on the back of so many trials of supposed 'terrorists', who would be prepared to represent the families of the accused men on a pro-bono basis or better still, for free? Meanwhile, the families of the bereaved, all of whom have waited over five years for these Inquests to commence, rightly feel outraged at the machinations of the State in its endless attempts, cloaked beneath the all pervasive banner of 'national security', to prevent them from knowing the truth. J7 7/7 Inquest Blog: July 7th Inquests - 'Life Extinct'? Originally posted on the 7/7 Inquests Blog: July 7th Inquests - 'Life Extinct'? On the afternoon of November 3rd, at the 7/7 Inquests, a Dr. Morgan Costello gave evidence via a videolink from Ireland. In his testimony, Dr Morgan Costello confirmed that, as a result of his work for the Metropolitan Police Service 'providing medical services and medical assistance'...' in relation to deaths in custody', in July 2005, he was asked to attend two scenes, Edgware Road and Aldgate, for the 'purposes of certifying the extinction of life'. Dr. Costello confirmed (page 3, lines 9-11) that 'It was very clearly described to me by the officers on the scene that they didn't want anything other than for me to pronounce life extinct on the victims'. Dr. Costello confimed that, in July 2005, he was a consultant psychiatrist, who specialised in a specialty of psychiatry, who then went on to work full-time for the police undertaking extra qualifications in forensic and legal medicine. Why a consultant psychiatrist was asked to pronounce on the extinction of life is not clear. Dr Costello's previous work as a consultant for the MPS, in relation to 'deaths in custody' would seem to have little bearing on the identification of numerous victims in the aftermath of an explosion, particularly in such extreme circumstances. Dr. Costello appears to have missed the 'part of a body...In fact a human spine' noticed by one of the first on the scene at Aldgate on 7th July, off-duty/plainclothes Police Sergeant Neil Kemp (transcripts Page 46, lines 7-15, 27th October pm) . The 'piece of spine' found at Aldgate was not insignificant according to the statement of Mr Nathaniel Carey read on 3 November 2010 (afternoon session, Page 16, lines 9-25). Dr Costello confirmed that he visited the Edgware Road scene at 00.59 on Friday 8th July, and then the Aldgate scene at 08.40 on 8th July. Dr Costello also confirmed that 'there were difficult considerations to be taken into account at the time and I was very much led by the crime scene manager, and there was difficulty accessing some of the bodies or even seeing them clearly'. The crime scene manager was DC Andrew Meneely, who in his testimony given on the morning of 3rd November (Page 66) stated that he was 'attached to the Counter-terrorism Command and New Scotland Yard' as a 'forensic scene examiner' but who now works in the [Australian] Bomb Data Centre. Dr Costello then goes on to confirm, being prompted and led by Hugo Keith through the list, that he identified (by code numbers of the bodies involved) six bodies at Edgware Road and seven bodies at Aldgate scenes as 'life extinct'. The numbers identified by Dr. Costello should have been seven bodies at Edgware Road and eight bodies at Aldgate, if the alleged 'bombers' bodies were included. It seems incredible that Dr. Morgan Costello should miss a 30cm x 14cm x 10cm piece of spine weighing 1.852kg, particularly if this is the 'piece of spine' to which Neil Kemp makes reference to seeing on the morning of 7th July. Further, Hugo Keith is directing Dr. Costello to his two statements dated 27 September 2005, rather than to any contemporaneous records that Dr Costello may have kept on two days in July. Despite the numbers of lives extinct pronounced at Edgware Road and Aldgate missing the alleged perpetrators in their totals, the Metropolitan Police appeared to be one step ahead of the medical professionals, or a couple of steps behind. In a period of thirteen minutes at around 6pm on the day of 7 July 2005, the Metropolitan Police issued two bulletins citing the number of deceased at each of the incident locations. The timings here, as with the entire story of 7/7, are important to note. An 18.03 bulletin claimed "there five [sic] fatalities" at Edgware Road. Yet, an update issued at 18.13 (just ten minutes later) but claiming to be based on "Latest from New Scotland Yard at 18:00" (three minutes prior the previous Metropolitan Police update) was claiming the number of victims as "7 at Edgware Road". Also worth noting is that there is no evidence/testimony provided by Hugo Keith as he links the 'life extinct' bodies with the Edgware Road/Aldgate victims names/identities. There is no mention of the 'Identification Commission' nor any mention of any death registration particulars/rulingsby the presiding coroner, Dr Andrew Reid, in July 2005. This means that there will never be scrutiny of the identification issues, relating to any and all of the victims, including the alleged bombers. What sort of an inquest is this? In a previous post we examined the alleged 'disintegration' of Shehzad Tanweer in the explosion on Circle Line train 204 at Aldgate/Liverpool Street, and the way in which the number of deceased at the location was consistently numbered as 7, a figure that didn't include the alleged perpetrator as one of the deceased. It is also worth noting the following information in relation to the identification and naming of Tanweer as the alleged perpetrator of this explosion. This ties in with the timeline given in the ISC report above -- although we now know that the viewing of the accused on CCTV at Luton station occurred some time before 12 July 2005 -- which states that the DNA analysis confirmed all four accused on 13th, 15th & 16th July. 'As regards the man who was reported missing, some of his property was found on the Route 30 bus in Tavistock Square. 'Property in the name of a second man was found at the scene of the Aldgate bomb. And in relation to a third man property in his name was found at the scene of both the Aldgate and the Edgware Road bombs. 'We also have very strong forensic and other evidence, that it is very likely one of the men from West Yorkshire died in the explosion at Aldgate. This, of course, is subject to formal confirmation by the Coroner. 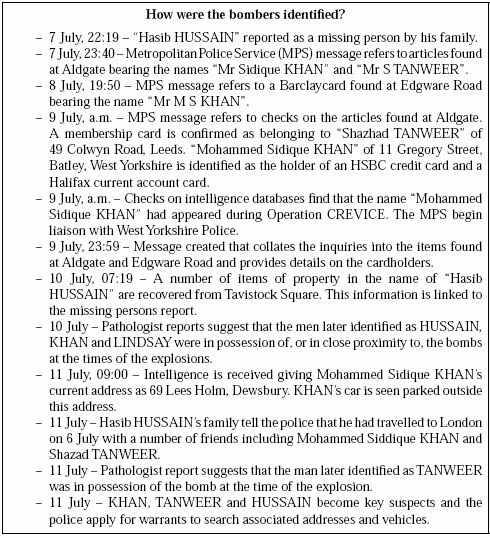 What forensic evidence did the Metropolitan Police Service obtain to confirm the presence of Shehzad Tanweer by 15.47 on 12 July if, as demonstrated above, the forensics were only just beginning to be carried out a day later on 13 July 2005?